Irrigation Design – A custom irrigation installation is designed by Matteo's Landscaping after a comprehensive site evaluation and stablishing your irrigation requirements based on lot-size and landscape features. We design commercial irrigation systems for quality irrigation components, proper pipe sizing and good hydraulics. When an irrigation system is efficiently designed it will conserve water, while giving you better coverage watering as compared to using traditional hoses and above-ground sprinklers. An irrigation system installed by Matteo's Landscaping will evenly water your lawn and plantings, in an appropriate quantity using timers and rain sensors. We will propose the most suitable technical solution to provide the best value for your money. Irrigation Installation - Matteo's Landscaping professionally installs automatic sprinkler systems with minimal disturbance to your existing lawn and landscaped areas. During installation our teams of experienced irrigation installers will ensure the proper irrigation pipe depth, straight line runs where possible and the proper tamping and leveling of soil. Irrigation Maintenance - Matteo's Landscaping has certified technicians dedicated to the service and maintenance of your irrigation system. We are trained to service every manufacturer equipment type, so even if we did not install your system we are prepared to help you with your service needs. Irrigation System Service Programs - Matteo's Landscaping will design a customized irrigation system service program that will keep your system running at optimal performance and efficiency. A properly serviced irrigation system can last for many years which can save you moneyin the long-term. Quality irrigation components, supplies and materials - Matteo's Landscaping only use quality products from the leading irrigation equipment manufacturers including irrigation timers, irrigation controllers/clocks, sprinkler heads, spray heads, rotary heads, sprinkler nozzles, manual valves, automatic valves, rain sensors, etc. We specialize in the installation and maintenance of rain bird irrigation equipment although we also install and maintain irrigation systems from other irrigation equipment companies and we guarantee our workmanship. 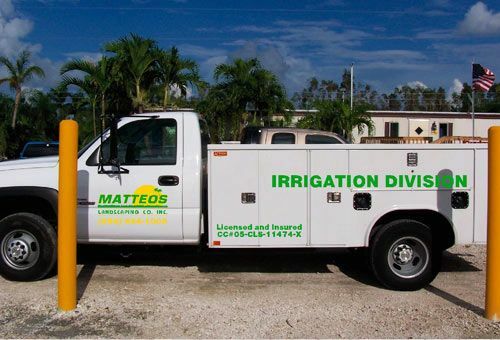 Matteo's Landscaping pays attention to detail and offer complete, prompt and courteous irrigation design, installation, maintenance services that carries an equipment and labor warranties. Contact us today for more information on our irrigation installation and maintenance services at (954) 444-1008 or complete the Contact Us form - click here.